Jiri Svestka Gallery Prague was founded in 1995 by art historian and curator Dr. Jiri Svestka after his resettlement from Germany, where he was, among other things, director of Kunstverein Duesseldorf and chief-curator of Kunstmuseum Wolfsburg. The mission of the gallery, which was one of the first private galleries in Czech Republic, has been – since its establishment – to enforce Czech and Central-European art in the international context. On the other hand, the aim is also to introduce interesting and various positions of the international art in Prague. Both of these tasks were handled successfully by the gallery. 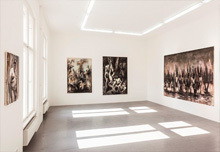 Czech and Central-European artists who exhibited in the gallery (Katarzyna Kozyra, Marketa Othova, Jitka Hanzlova, Ioana Nemes, Dan Perjovschi, Kristof Kintera, Petra Feriancova, Rafal Bujnowski and others) has established themselves on the European art scene and also since then have had exhibitions in significant public institutions. International artists that were introduced in Prague by the gallery (Dan Graham, Doug Aitken, Robert Wilson, Siah Armajani, Ger van Elk, Juliao Sarmento, Juan Munoz, Robert Moskowitz, Jorg Immendorff, Ryan Mendoza, Tony Cragg and others) have enhanced Czech culture and set a high level for Czech contemporary art and its perception. Jiri Svestka Gallery has significantly contributed towards the growth of the art market in Czech Republic and Slovakia. Several ex-employees have established their own galleries of contemporary art. Jiri Svestka Gallery Berlin was founded in 2009. Its agenda was focused even more on the art of central and east Europe. During the seven years of existence, the gallery has presented artists from the youngest, not well-known (Sofie Svejdova, Jan Durina, Andrej Dubravsky, Adela Babanova, Mark Ther) to known and established artists of the middle and older generation (Miroslav Tichy, Leonid Tishkov, Jan Kotik, Georg Ettl). The exhibition space in Berlin was closed in 2017 in order to keep the gallery more concentrated on the resolutions and the gallery functions on regular basis exclusively in Prague.